If you are like me, you know that there is no other choice when it comes to your dress than Steven! He truly is a master at making brides feel like the best version of themselves. It breaks my heart to part with the dress of my dreams but it breaks my heart even more to have it sit in a box in my wardrobe. 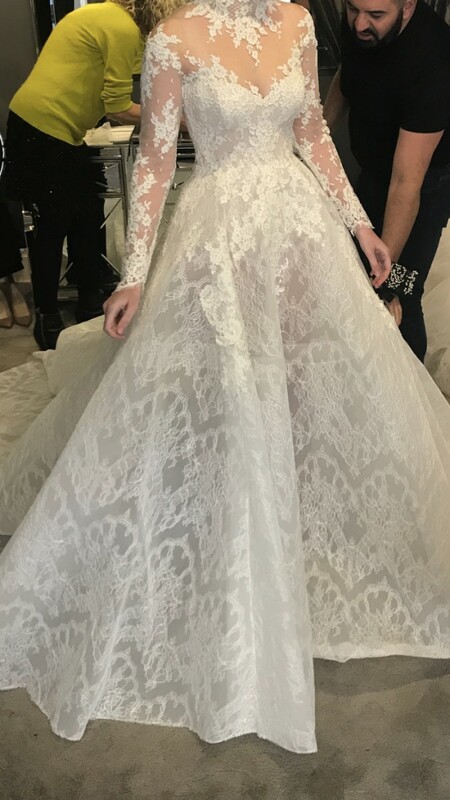 So, I have decided to sell my custom designed Steven Khalil wedding dress (worn in October 2018) so that another bride can feel just as amazing and perfect as I did on my day. This dress is truly unique. It features a high neckline, key hole back and full skirt. The skirt is only one layer thick and is made from an Italian lace that has been stiffened to keep it in place. The single layer on the skirt makes it sheer (legs can be seen through the dress) however strategic placing of a second layer of lace means that what should be kept private is. The skirt has the voluminous look that Steven is so well known for but it is so light and just moves with you as you walk so there is no fussing. I wore the dress throughout my entire wedding and it was just so comfortable, I was so sad to take it off at the end of the night. The bodice has a double zipper and waist strap belt for extra comfort and support and forms part of a body suit that is attached to the skirt (so the dress is one piece). This unique and elegant masterpiece is perfectly suited for a size 6-8 body and is sure to make any bride feel like a princess on her special day. I have had the dress professionally dry cleaned and it is essentially in the same condition as when I picked it up from Steven. It is currently being stored in acid free packaging and tissue to preserve the fabric and shape. If you have any questions or want more photos please contact me.